When I look back at the bygone past of 2015, I still remember the toehold first day of 2015 of resolution I made for. And when I conclude the year to begin yet another year I feel brilliant that I have been living up to my resolutions and heightening to greater heights as I deserve to be. And that's the absolute exhaustive reason for Resolutions 2016. Making Resolutions for yourself is like building Feathers into Wings: For every feather of optimism you weave, it's obviously as always as that you shall have that hope of wings at the end and those are exact wings those shall take you high in the sky of your own dreams and nigh to highness of success. Resolution shall be your guiding star that shall take you in your way unless you feed it with your own sincerity. This year's resolutions as I've after a thoughtful decision are as mentioned above. I unsurprisingly concentrated on Reading because I thought it was absolutely necessary for everyone of us, if not for me, it's an extraordinary need. For me, Reading is what Joseph Addison exactly quoth: Reading is to the mind what exercise is to the body. Like feeding your body with nutritious diet, it's all-important too to feed your mind/brain with nutritious diet and that's what reading can be the best way to feed your mind. Please feed your mind/brain with nutritious diet because your mind is the greatest treasure you have of an immense measure, with mind you can do everything. Reading is the best elixir to boost your mind through which you can stretch your mind into any direction for everything: your dream, your theme, your wishes and ad infinitum. I've a list of books to be read in this year and I've been posting in my Instagram: the BrainShelf of 2016. I'm hoping to read and read and heighten myself in my dreams. Simply, I love Books. I love Reading Books very much. I'm a Bibliophile. Other resolutions too are great for me because I feel those are invaluable values all of must possess because everyone of us ultimate desires and dreams are same though the path we take might differ. Writing suit me as much as Reading does because I write because I read. Writing is the way of expressing your thoughts and that's the basic rights/freedom we're gifted naturally. We deserve that rights before we are born and even after our death also. So Writing can be the best way of proving yourself/the world that: Yes! I'm really relishing your Right. From now, start writing your rights, it's the way to right yourself. Other resolutions are simple enough, I call them Small Big Resolutions because if you study them mindfully every one of them has to start from a single step to mine thousand miles. Obviously, in the World it's an old aphorism: Every drop of water makes mighty ocean. So it's earth-shattering and epoch-making to concentrate in every step for you reap what you sow. Be Proactive like Water: I felt great about being Proactive like Water. I owe to Stephen R. Covey for allowing me to make my resolution. Be Proactive is the first Habit from The 7 Habits of Highly Effective People. Proactive in simple is, Non Reactive. Being Proactive like water means adjusting yourself to fit any situation just like water fitting all irrespective of dimensions. Bruce Lee beautifully puts on this: Empty your mind, be formless. Shapeless, like water. If you put water into a cup, it becomes the cup. You put water into a bottle and it becomes the bottle You put it in a teapot, it becomes the tea pot. Now, water can flow or it can crash. Be water, my friend. And I continue, Cheers! friend I'm be water. 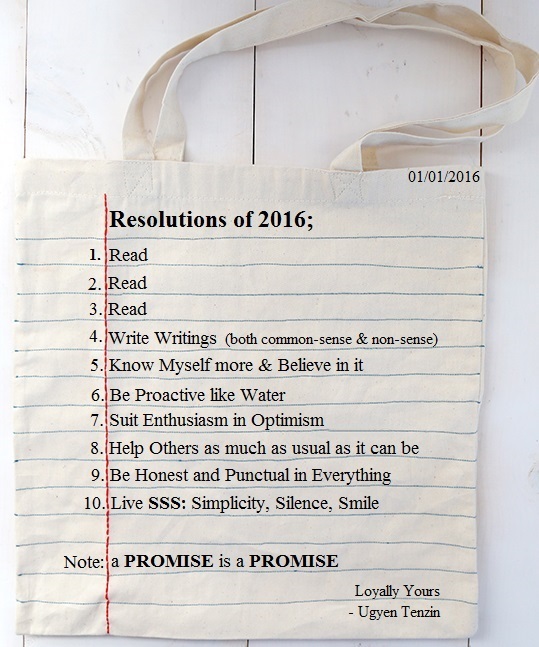 As 2016 begins I'm sure that you're well prepared with your resolutions to start new year. Wish you Happy New Year. May this year be much better than last year and much lesser than next year. Huge good luck as you prepare to open the upcoming chapter of your life ahead as you head with enthusiasm and optimism, yeah live Enthusiasm in Optimism. See you everyday doing Great. Happy New Year and may you acquire more knowledge and happiness each day. My wife and I love books too. We have many book shelves at home and have not finished them. Reading is the best form of relaxation for me.